With just four full days to go the show field is already all a buzz. We are getting ready for you and we hope you have Saturday in your diary. 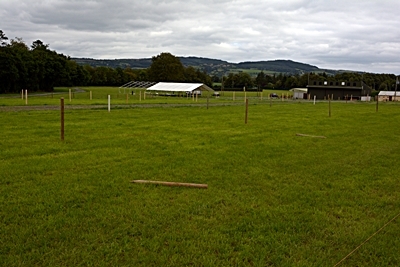 Marquees are being erected fast and furiously. Trade exhibitors are eyeing out there patch and stewards are busy getting there section in order. With very heavy rain last night we need a few prayers for good weather. Nevertheless the grounds look magnificent. The new poultry cages look great. Last year’s traditional cottage has found a new home in the vintage section and looks well. The working hunters have some new jumps. Our local tug O war team have been practicing hard. The Iverk Food Market marquee looks huge but when filled with exhibitors the smell of locally produced food will knock you out. The fashion show will be bigger than ever with more local models taking part. The grapevine says the most appropriately dressed lady competition will be a knockout. Ladies are having difficulty deciding whether to ware rain gear or summer outfits.